Rock and roll is alive, and it lives in Liam Gallagher's greengrocers. The star was in ebullient form at Wednesday's Q Awards, batting away questions about the lack of new guitar bands with typically comic bravado. "I know people talk about the death of rock 'n' roll, but for me it never went away," he told the BBC. "I live and breathe it, whether I'm making a record or buying bananas. Because I buy bananas in a rock 'n' roll way, you know what I mean?" Gallagher did not explain how a rock star purchases a banana, but presumably he asks for a Roll With It. Q Awards: Have the Manics made their final album? The star, whose debut solo album As You Were went to number one last week, went on to win two trophies: Best live act and the Q icon award. But he said he was "a bit disappointed" at losing the best single prize to Kasabian's You're In Love With A Psycho. Here are some of the other things we learned at the ceremony. Ed Sheeran received his prize - best act in the world today - with one arm in a sling (well...Burberry scarf) and the other in a cast after a cycling accident over the weekend. 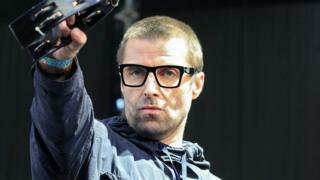 The star told Radio 1 he had fractured his right wrist and left elbow, as well as breaking a rib. "It's a pretty dull constant pain," he said, "very similar to having a tattoo." Q Awards host Christian O'Connell joked that Sheeran had been knocked off his bike by someone "who saw him on Game of Thrones". Paloma Faith's fourth album, The Architect, is due out next month, so she's spent this week auditioning musicians to play the new songs live. It didn't go completely to plan. "Yesterday, I was auditioning drummers," she said. "And I was like, 'You didn't get the job!'" Asked how he celebrated his number one album on Friday, the star replied, "I didn't". "This is the first time I've been out of the house since," he said, offering a most curious explanation. "I just got back from LA and I was crowd-surfing there and [the fans] were pinching me. "I don't recommend it to anyone. My bum's been sore, so I've just been lying on my bed flat." Grime star Skepta has been in the studio with punk duo Slaves - but he's not sure the public are ready for the results. "That song, it's like an anarchist's anthem," he told 6 Music's Abbie McCarthy. "We haven't dropped it because... it's a very dangerous song. The world's not ready yet." The Mercury Prize-winner said the collaboration was fuelled by fury. "They were at a point and I was at a point where we wanted to just scream something to the world. And we definitely screamed it. It's a mad song." George Ezra's latest video, Don't Matter Now, sees the singer taking a road trip with a cute, fluffy dog. But it turns out their bonhomie was all a terrible lie. "It's not my dog, I can't stand dogs," said the singer. "I've had bad experiences with dogs." In fact, his co-star turned out to be something of a diva, with its "own agent" and entourage. "It got far more attention than I did on set," laughed Ezra. "Now, I'm not a man who needs a lot of attention but a line was crossed by that there dog!" Wiley picked up the innovation in sound award, recognising the impact he's had on UK music since 2002 - when he set the blueprint for grime with his instrumental track, Eskimo. He said the award was "the one where you do your time", persevering through the ups and downs of the music industry until "they look, they recognise". But despite the recent resurgence in grime, the star said the UK desperately needed new musical innovators. "I haven't heard a new sound in England for ages," he said. "We're looking for it: It could be a band, it could be kid with a guitar and a piano. "I don't know what it will be, but we're looking for it." Have the Manic Street Preachers made their final album?